Eblis, the mastermind behind Hell’s troubles, unfurls his wings. Hell Eternal, a 5-player dungeon intended to take 15-45 minutes to complete, featuring 6 challenging, scripted encounters. 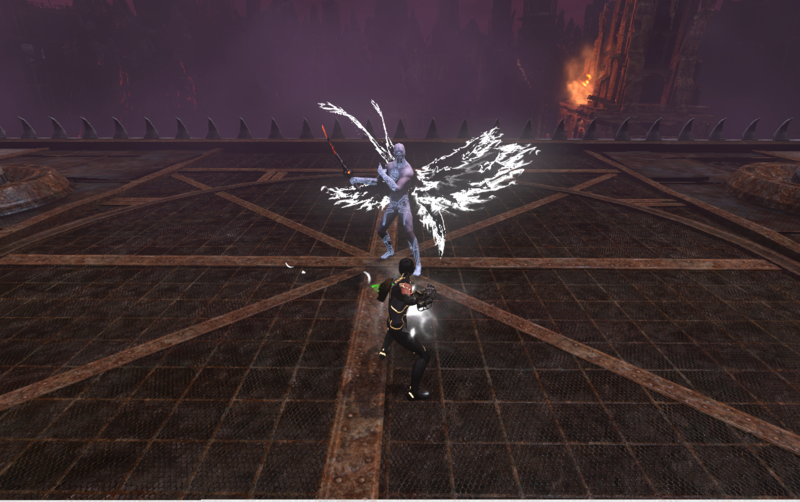 Hell Eternal was the second full dungeon assigned to me in my time on The Secret World. 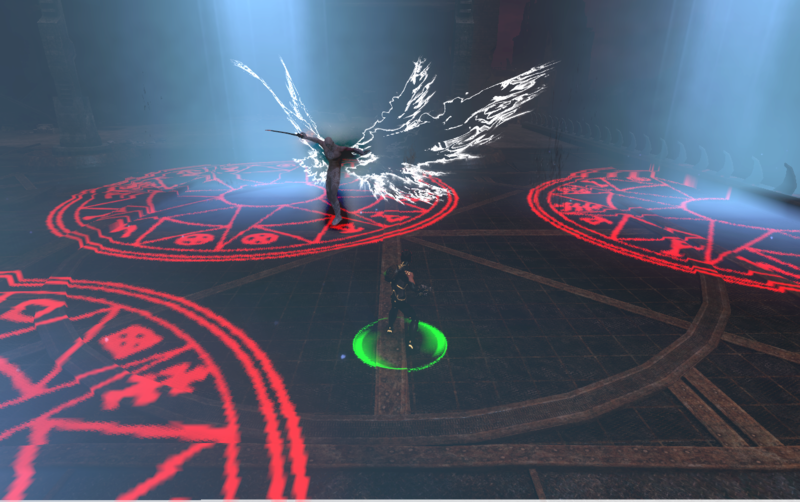 From concept to release, it was developed in six months, a significant decrease in time over Hell Raised, which required rework due to sweeping changes in TSW’s role playing systems. The last in a series of three dungeons dealing with the Hell dimensions, Hell Eternal closes out the storyline that the players have been following since Hell Raised. At last, the true nature of the civil war in Hell is revealed; a dark angel has been fomenting unrest, and assaulting the human magus Theodore Wicker to undo his attempts to build a unified Hell. The burning Infernal Overwatch, a Jinn, summons a horde of allies when attacked. Players take on the role of an elite strike force moving stealthily through the war-torn city of Sheol, as Theodore Wicker’s demons do battle en masse. I asked that the structure of the dungeon feel more open, and less restricted to corridors than previous attempts. In order to lead players through a more confusing space, I devised two primary mechanics. First, Saccharissa, Theodore Wicker’s succubus lover, flies ahead of the party, throwing up flares to guide them through difficult areas. Second, a monster called the Infernal Overwatch stands as an incredibly bright warning to avoid a specific area. This creature summons a number of allies, and, in groups, should be nearly impossible for any team to conquer. The combined mechanics worked well when tweaked through playtesting, presenting players with a flexible space while encouraging them towards the intended path. Hell Eternal was structured similarly to our other dungeons, featuring only a few instructional trash encounters, three minibosses, and three bosses. For a detailed look at the design behind a few of the more exciting fights in Hell Eternal, read on. Working on the dungeon team was an intensely collaborative process, and I don’t want to misrepresent. 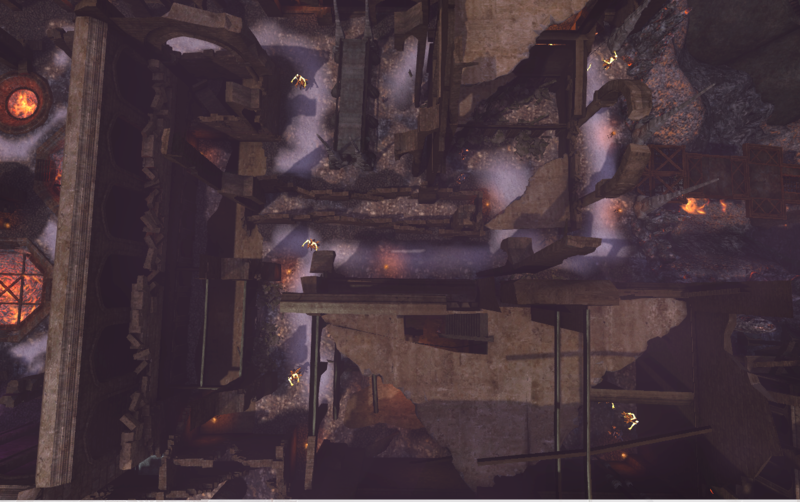 Players drop down into ruined foundations, taking a less direct but less guarded route. Some of the ways players advance through the dungeon look non-standard, or less than obvious. 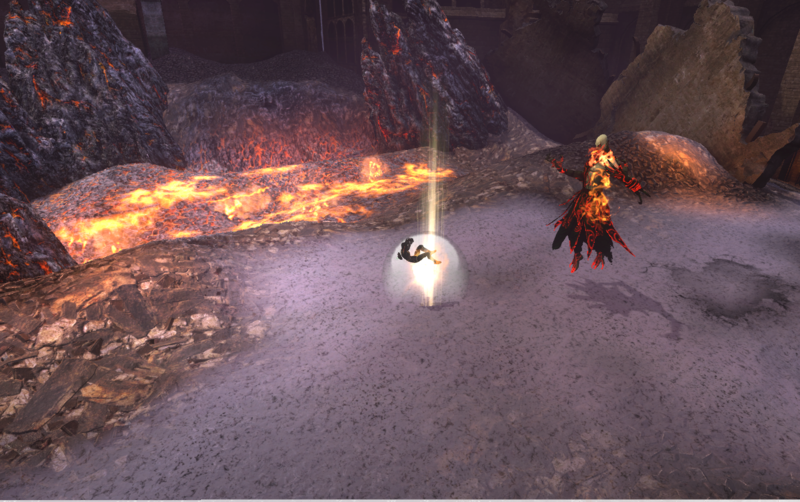 When the players kill the first miniboss, the Archaean Seismocratist, they drop down into the ruined foundations of a nearby building, avoiding detection by selecting a less visible option. 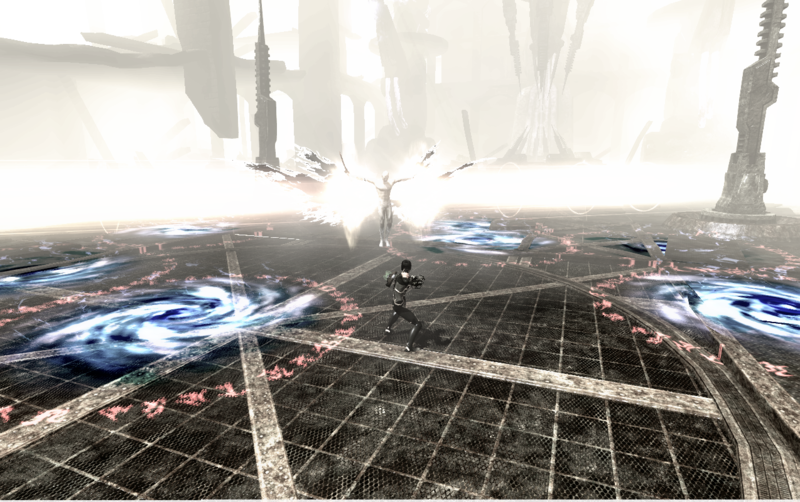 On exiting that area, the enemies they face are all facing away from the player, emphasizing the fact that players are approaching from an unexpected direction. The Infernal Overwatch monster is one of the first players encounter. It’s a challenging enemy itself, and it summons a large number of allies; players are only required to fight this creature in one area, to be sure they understand the mechanic. This is critical for a sequence later in the game, where players move through a maze while avoiding clusters of these monsters, some of which patrol along paths, or change their facing periodically. One of the miniboss encounters, the Flagellatrix Superior, takes place in an arena composed of corridors. As players take down the Flagellatrix, massive enemies patrol in a pattern. The Flagellatrix will set the arena on alert, causing these threats to begin running for a short period of time; if the players are caught by one, the arena goes on red alert, and all three come running. Players must move through a complex maze, avoiding clusters of glowing Infernal Overwatch monsters. The Archaean Seismocratist pulls distant players close, and then triggers a close range explosion, knocking them into fire if they fail to run away. 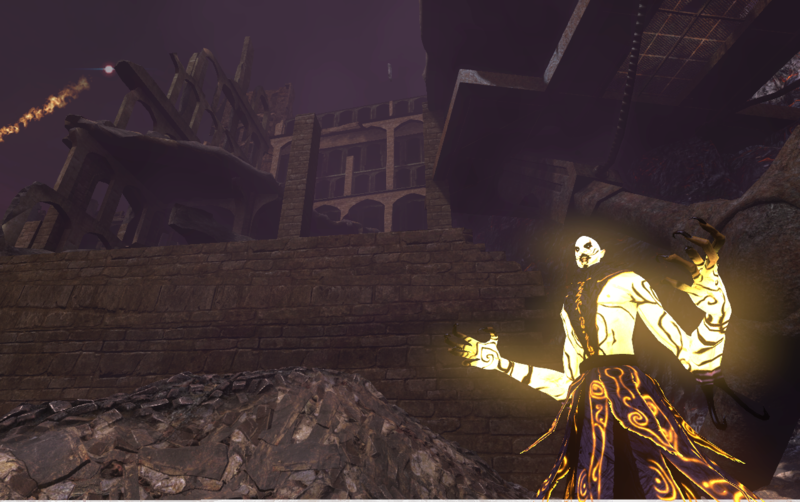 A fiery jinn stands stationary, guarding the blasted and burning ruins of a city square. The mechanic of getting knocked back can often be minimized simply by putting your back to a wall. The initial design of this encounter had a great flow of players getting knocked away, then pulled close, and always the threat of getting knocked into a fire pit. To avoid the “back to wall” tactic, I chose to have this spellcasting jinn stand stationary, on guard in the center of the arena. In order to engage with him, players are forced to put themselves at risk. This fight also introduces two mechanics used elsewhere- two other encounters also turn members of your party into bombs, requiring them to run from each other; and a later encounter takes place on a platform above a pit of fire, where knockback explosions threaten to send group members flying to their deaths. Eblis drains the life of a party member down to 1, forcing an immediate response from the healer. Eblis, an angel in Hell, is furious that his divine plans have been repeatedly thwarted by humans. As a last resort, he brings his angelic powers to bear, giving any team an unforgettable challenge. Eblis pulls the group into an Angelic Phase, where he has a powerful advantage. This fight really clicked for me with the question “How would an Angel fight?” It seemed clear that, as a creature foreign to Hell, he probably had magics that looked and acted very differently to what we’re used to. The idea of him trying to pull players into an environment where he had an advantage was the inspiration behind the Angelic Phase, a golden glowing otherworld with wicked moving hazards. Eblis calls down powerful magic strikes from the heavens. Angelic, he also had command over life and death, inspiring the spell draining a target to 1 health. A consummate swordsman, Eblis can dash through targets, infecting them with explosive magical energies; he even gifted this magic to some of his minions, who used it on the group earlier in the dungeon. 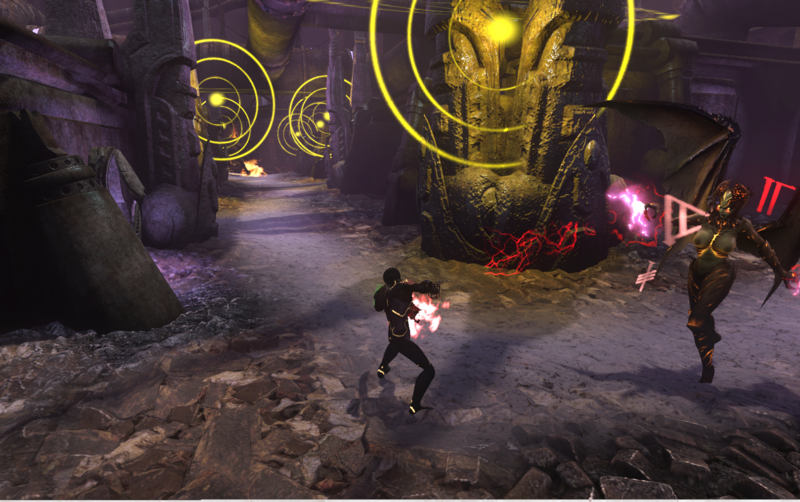 The overall result is a fight that feels intense, challenging, and suitably impressive for finishing the story arc of the Hell dimensions in The Secret World.